Not too many Brits in the football industry head to Eastern Europe to try and make a name for themselves. But Joe Palmer is happy to say he took an unconventional route in his career. Before becoming Sheffield Wednesday’s chief operating officer at the beginning of July, Palmer was a key figure in Shakhtar Donetsk’s managerial think tank. He spent six years working as the Ukrainian giants Executive Director of Strategy, Commercial and Marketing. “Shakhtar was different!” Palmer chuckled. “It was a great experience and a big challenge. “When I first arrived, there was nothing really in place. We built from the bottom up. Palmer’s background and expertise lies in sports marketing. His brief at Shakhtar was to re-organise the club’s structure off the pitch, help increase their match-day attendances and develop their commercial strategy. “It was very difficult, in one sense, in Ukraine as there is a real gulf between the low income segment of the country, which is the majority, and the very wealthy,” he said. “For the people on low income, it was tough trying to get a share of their wallet when they have to spend on basics like food. “We had to keep everything in line with salaries and Gross Domestic Product (GDP). We couldn’t go crazy. “But at the same time, we had to keep an eye on Financial Fair Play (FFP). Where we could make money, we did. “A lot of our packages were structured around the wealthy. “We did research for all the ticket prices around Europe as a percentage of all people’s wages and we applied the same factor in Ukraine so people ended up paying two euros at the lowest price. It was relative to what we could afford. Shakhtar knocked Dynamo Kyiv off their perch, winning the league five times in a row between 2010 and 2014, and Palmer is proud of the role he played in their success. “We had the highest attendances in Eastern Europe,” he said. “They were higher than the Turkish clubs which was one of the big things. He also played his part in promoting grassroots football and increasing the numbers of youngsters participating in the beautiful game. Palmer said: “We helped introduce projects on the community and social side which didn’t exist out there at the time. I helped create the model for it. It took two years of pushing to get it implemented and eventually the investment was put in. Because of the conflict in the Ukraine between government forces and pro-Russian rebels in 2014, Shakhtar were forced to set up a training base in Kiev and play their home matches in Arena Lviv, which is over 600 miles away from Donetsk. More than two years on since the start of the civil war, Shakhtar continue to play in Lviv and it remains unclear whether they will ever play their home matches at the Donbass Arena again. Palmer left the country just before the war started. When asked if he ever feared for his safety, he said: “Not really. It was still relatively calm right up to the point of war. Not long after leaving Ukraine, Palmer received some desperately sad news. Palmer split his time working remotely from England and travelling back and forth to Kiev. “Kiev was like a whole other country,” he quipped. Wednesday came calling for Palmer over the summer and it proved too good an opportunity for him to turn down. 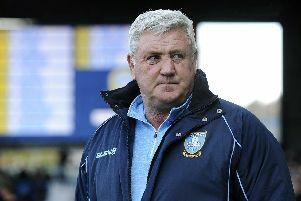 He admitted: “I stopped working for Shakhtar as soon I got contacted by Sheffield Wednesday. I knew I needed another challenge. It had run its course at Shakhtar. I had done some big things there and with the situation they were in, it was very tough to see what more I could do. Palmer’s duties include formulating the commercial and corporate strategy of the Championship club, together with overseeing the retail, ticketing and marketing operations. It has been a stressful period for Palmer, with the Owls opting to bring their catering operation back in-house. He has overseen that transition and is still trying to find the time to organise his own office! Palmer said: “You could say it is a brave move bringing the catering in-house but when is the right time to do it? I actually think doing it during the season forces you to make changes quicker. If you do it out of season, there is a tendency to maybe sit on it for a bit. So what precisely is Palmer’s remit? “I’m bringing new ideas to the table,” he said. “The key thing is how we bring the club up to a Premier League level. “If you are club who wants to get into the Premier League, you need to start behaving like it off the pitch. For him, the raw materials are in place to take the club to the next level. But Palmer stressed: “It is about doing things that mean we don’t lose our identity. Everything we do has got to be something which is unique to Sheffield Wednesday. “Some clubs do their catering fantastic. Others do amazing marketing and digital work. “It is a case of looking at them all and deciding what’s best and what can work for you. Certain clubs do things really, really well abroad. Whatever happens, Palmer’s pedigree and business acumen should prove invaluable in Wednesday’s quest to become a major force once again.